I haven’t created a recipe in awhile. Aside from my usual veggie burgers, vegan mac and cheese and lemon rice, I haven’t ventured into experimentation in the kitchen. Perhaps it’s the oppressive heat or traveling or taking on more writing assignments. I’m currently reading The Happiness Project in which author Gretchen Rubin recounts the year she systematically and methodically pursued happiness. It’s so easy to get caught up in daily life that you sometimes forget what brings you the most joy. While a lot of things make me happy, cooking is one I let fall by the wayside. So yesterday, I was back in the kitchen! Huzzah! But as I peered into cabinets and excavated packages in my fridge, I realized I didn’t have a wide variety of ingredients in which to whip up a dish. Luckily, I always keep some fresh produce on-hand (tomatoes and potatoes are an absolute MUST) as well as over 30 spices. My partner also picked up some zucchini at the store a couple days ago, knowing how much I love it (isn’t he so thoughtful??). When I was in NYC this past weekend, I found a tube of tomato paste just like the kind Giada de Laurentiis keeps in her pantry. Well of course I had to buy it! So as weird as this might sound, I wanted to build a recipe around the tomato paste. What could I put it in? I usually pour it into pasta sauces…but I eat waaaaayyy too much pasta. Then I thought about soup. As I was looking through cookbooks for inspiration, I came upon a recipe for Al-Ghara bi Tamatim (Zucchini and Tomato Stew) in Habeeb Salloum’s Classic Vegetarian Cooking from the Middle East and North Africa. I added the tomato paste which thickens the stew and adds intense tomato flavor, the chickpeas (for hearty protein) and the spices turmeric (I adore its earthy aroma and slightly bitter taste), cumin, cayenne (instead of paprika because I like its level of heat more) and cinnamon for a touch of warm sweetness. This is a simple, hearty stew with layers of complex flavors. Perfect for summer and winter, it’s equally delicious hot or cold. Actually, I prefer it cold. It’s a nice contrast to feel the cool, refreshing tomato broth alongside the heat from the spices. 1. In a large pot, heat olive oil on high heat. Add onions and garlic. Sauté for about 3 minutes or until onions are golden. 2. Add tomatoes, zucchini, water, tomato paste, coriander, cumin, ginger, turmeric, cayenne, cinnamon, salt and pepper. Bring to a boil. Then reduce heat and simmer for 15 minutes. Stir frequently. 3. Add chickpeas. Add a bit more water if needed. Simmer for another 10 minutes. 4. Season with more salt and pepper if needed. May be served hot or cold. 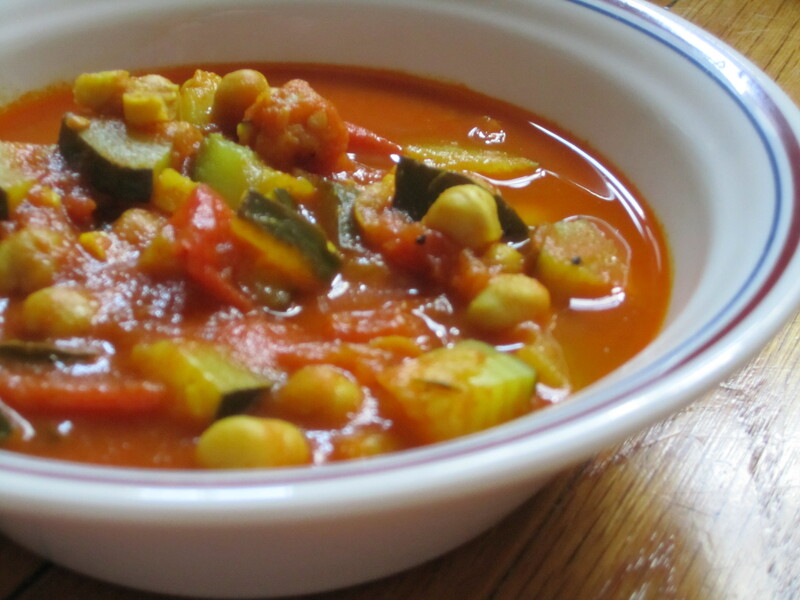 Tags: chickpeas, Habeeb Salloum, Moroccco, recipes, spices, tomatoes, vegan, vegetarian, zucchini. Bookmark the permalink. Previous post ← Princess Leia: Feminist Icon or Sexist Trope? Mmm, this sounds delicious. We’re experiencing some uncharacteristically drizzly and cool weather in Chicago right now, so this would be a very comforting stew! Oooh, sounds wonderful…cold and hot. I’ll have to give this one a whirl! Thanks for sharing this recipe! I was low on groceries too, it’s simmering on the stove – looking forward to enjoying this.